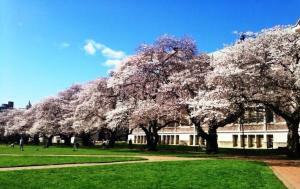 The Quad in the University of Washington campus is probably the #1 spot to view Cherry Trees. The trees were originally planted in the Washington Park Arboretum around 1939, but then transplanted to UW in the 1960s, due to 520 floating bridge construction. They now line The Quad at UW. PT: Take the Link Light Rail at the SeaTac Station & arrive at Intl District/Chinatown Station. Transfer to Bus #72 or #73 at Bay A. With 230 acres of gardens, including a Japanese Garden, the Arboretum is definitely a sight to see. 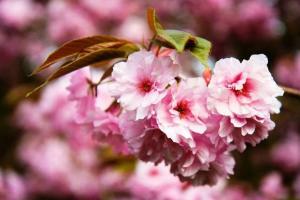 You’ll find all types of flowers and trees there, including Cherry Trees on Azalea Way and in the Japanese Garden. PT: Take the Link Light Rail at the SeaTac Station & arrive at University Street Station Bay A. Transfer to Bus #255 at Bay B & arrive at SR 520 & Montlake Frwy. Transfer to Bus #43 at Montlake Blvd E & E Lake Washington Blvd. (exit before crossing floating bridge). 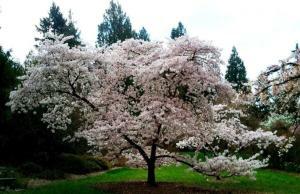 Seward Park is the original home of the Seattle Cherry Blossom Festival. Now, the festival takes place at the Seattle Center every Spring. The very first three Cherry Trees were planted in Seward Park in 1929, which were then followed by 3,500 more throughout Seattle in 1930. PT: Take the Link Light Rail at the SeaTac Station & arrive at Othello Station. Transfer to Bus #50 at Martin Luther King Way & Myrtle Street. Car: From I-5 N, exit 157 ML King Way. 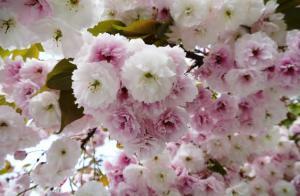 Jefferson Park was very popular amongst Japanese-Americans living in Seattle in the 1920s, so to celebrate the park’s 100th birthday, The Seattle Cherry Blossom & Japanese Cultural Festival Committee donated 25 cherry trees to be planted at Jefferson in 2012. Transfer to Bus #36 at Martin Luther King Way & Myrtle Street. Car: From I-5N, exit 163 Columbian Way. The Consul General of Japan, the Honorable Kiyokazu Ota, along with the City of Kitakyushu in Japan, gifted Cherry Trees to Tacoma to celebrate the friendship they have had since 1959. They are planted in the Japanese Garden. PT: Take Bus #574 at the SeaTac Station & arrive at Tacoma Dome Station Zone E.
Transfer to Bus #41 at Zone D.
Car: From I-5S, exit 133 toward City Center. Continue onto I-705 N, exit Schuster Pkwy. 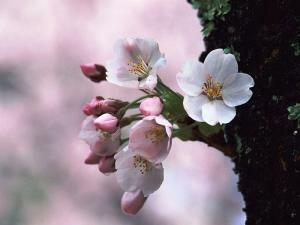 The Seattle Cherry Blossom & Japanese Cultural Festival is held annually in April at the Seattle Center. Celebrate and experience the Japanese culture through Taiko drumming, live dances and performances, arts and crafts, food, and more!